This comforting turmeric-spiced rice and lentil porridge is my go-to recipe when someone in my family is feeling under the weather. I personally find khichdi to be a very soothing and healing food, especially when topped with lots of ghee. 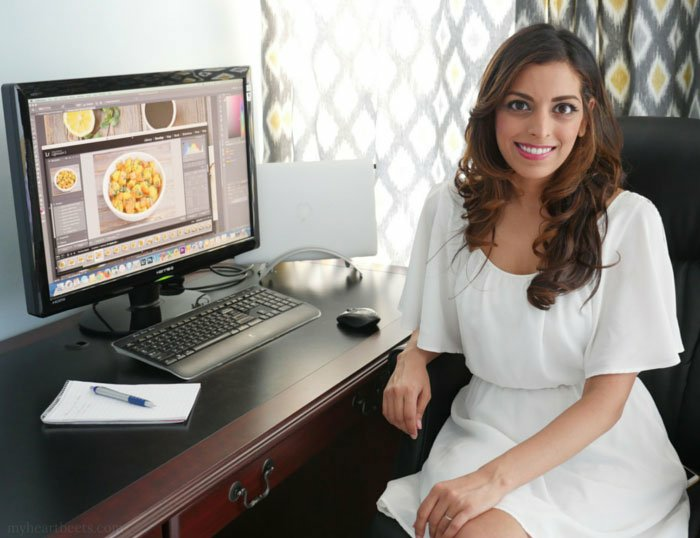 This Instant Pot Khichdi is one of the recipes in my Instant Pot Cookbook: Indian Food Under Pressure! It’s so simple to make! 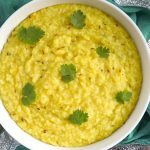 It calls for a handful of ingredients, the main two being basmati rice and small yellow lentils, also known as moong dal. In many Indian households, this dish is often prepared for the very young, the sick and the elderly. When I came home from the hospital after giving birth to Tony, my mom made me this porridge every day for a week (along with other healing foods) because it’s thought to be easy on the stomach. When Tony starting eating solids, khichdi was one of his first foods and he loved it! 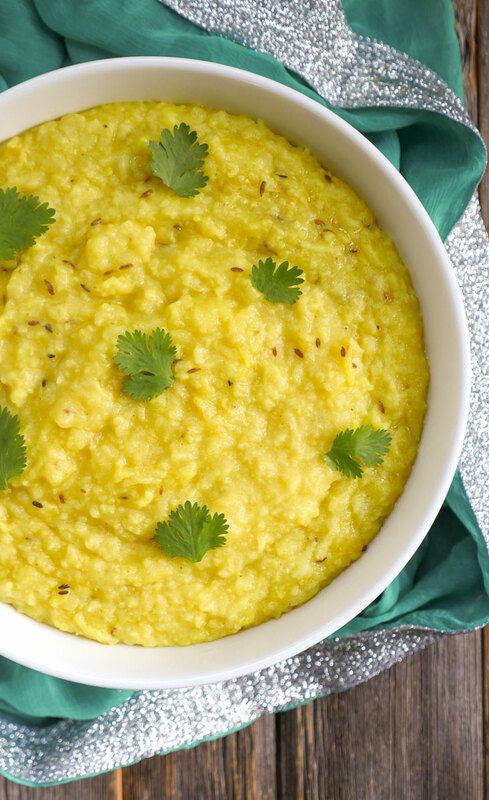 Khichdi is prepared slightly differently depending on what region you’re from in India. Below is the way my family makes this dish: with a few simple spices and plenty of ghee. 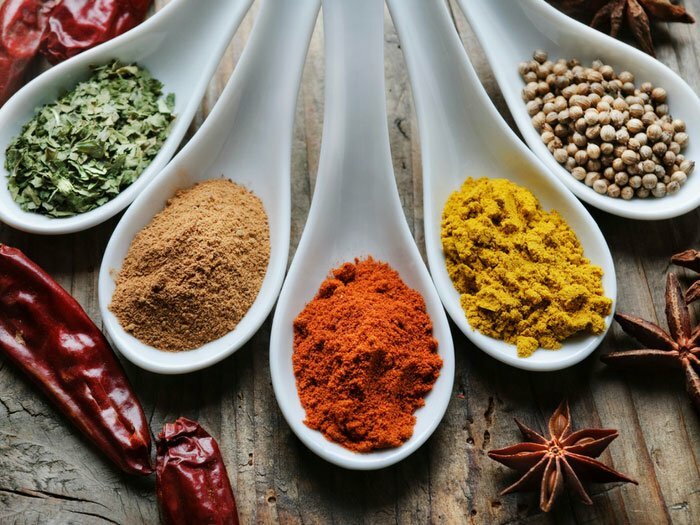 The great thing is that this recipe is easily customizable, so feel free to add ginger, garlic, green chilies or more spices if you wish. I almost always add chopped green chilies to my husband’s bowl – but that’s true of almost everything I make. you feel a cold coming on. you’ve been eating terrible lately and are in need of a detox. you have an upset stomach/tummy ache. 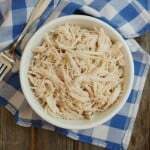 you want to eat something easily digestible (great postpartum dish). hungover? yep, you’ll want a bowl of this. Whenever I make this savory rice and lentil porridge, I typically eat it on its own but that’s because I usually make it when this is the only thing I can eat. If you’re making this as part of a meal, you can really serve it with anything – like you’d do with rice. You can serve it with a meat based curry, vegetables and/or a side of achar (Indian pickles). I hope you love this hot lentil rice dish! In many Indian households, this dish is often prepared for the very young, the sick and the elderly – it’s thought to be easy on the stomach. 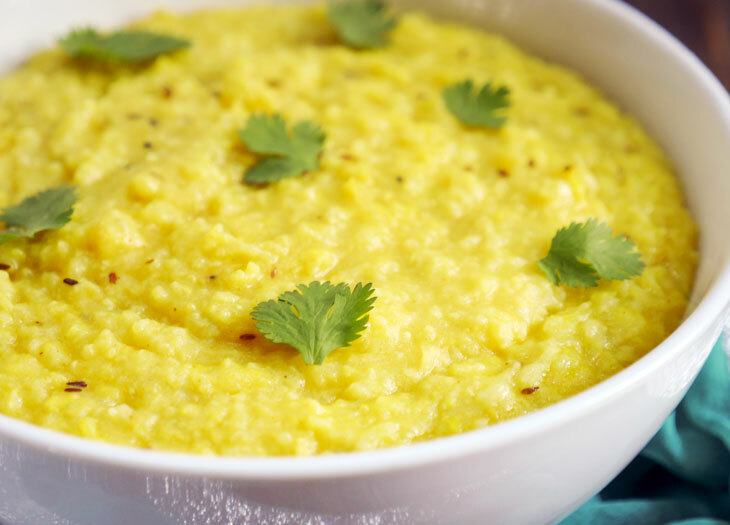 Khichdi is prepared slightly differently depending on what region you’re from in India. 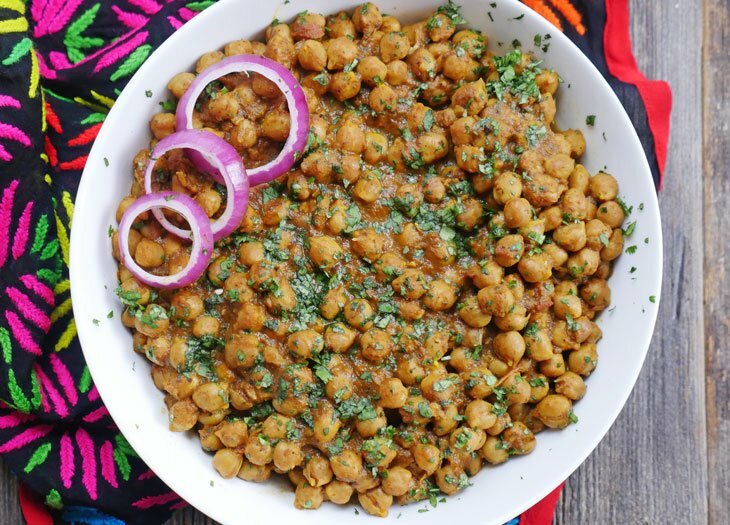 Below is the way my family makes this dish: with a few simple spices and plenty of ghee. This recipe is easily customizable, so feel free to add ginger, garlic, green chilies or more spices if you wish. You can also make this porridge as thick or as thin as you’d like. If you prefer a thinner consistency, just add more water at the end. 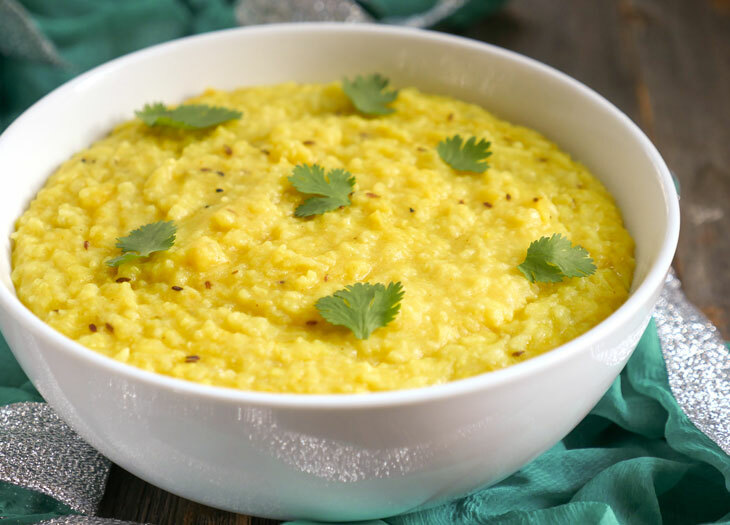 Soak the basmati rice and small yellow lentils (moong dal) in cold water for 15-30 minutes. Drain, rinse and set aside. Press the sauté button, then add the ghee or oil. Allow it a minute to heat up, then add cumin seeds and the bay leaf. When the cumin seeds turn brown, add the rice and lentils (moong dal) along with the 6 cups of water, salt and turmeric. Naturally release pressure for 20 minutes. Open the valve to release any remaining pressure. Serve each bowl with a spoonful of ghee and a pinch of salt. This recipe is easily customizable, so feel free to add ginger, garlic, green chilies or more spices if you wish. You can make this porridge as thick or as thin as you’d like. If you prefer a thinner consistency, just add more water at the end. Also, if you are re-heating the khichdi the next day then you will need to thin it out as it thickens over time. I highly recommend topping your bowl with a spoonful of ghee and a pinch of salt before eating. Hi Ashley! This was a great recipe! Turned out beautifully! I usually make khichdi with mustard seeds, but I like how you used jeera/cumin seeds! Hi Ashley, I made this recipe last week with the intention of eating it a few days later. Right after it was done, the texture looked like your photos, where the grains of rice and lentils were distinct. 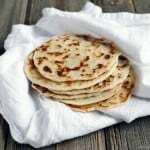 However, after being in the refrigerator, it had congealed into one sponge-like mass, and even after reheating and adding a bit more ghee, it was still uniform and distinction of the grains was lost. Is this normal after refrigeration? I bought the rice and lentils a few months ago so they had not been sitting in the cupboard for long. The only thing I changed was adding some garlic and ginger the recipe before adding the rice and lentils. I enjoyed the flavor but the texture was off-putting. Thanks! Hi Maiteeny! When you re-heat khichdi or any dal after it has been in the fridge then you almost always have to add water or broth to thin it out over the stovetop! I’m sorry for not explaining that – I have updated the notes to explain that 🙂 Thank you so much for bringing it up! This made a HUGE difference. I’m no longer hesitant to make this again. Thanks for the tip! I only had whole moong at home, so I added 5 minutes to the cook time (for a total of 25 minutes), left the rest the same. It was delicious! Can’t wait to eat the leftovers!! 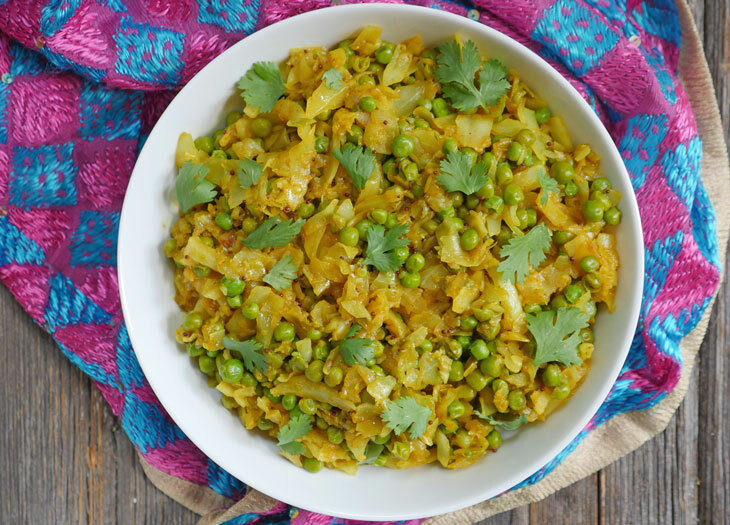 Deepa, great to know what whole moong worked well with this recipe! Thanks for sharing! Hi – mine came out mushy – i followed the recipe as it showed and naturally released after 20? Is this supposed to be more grainy and rice is distinct or more like oatmeal consistancy? 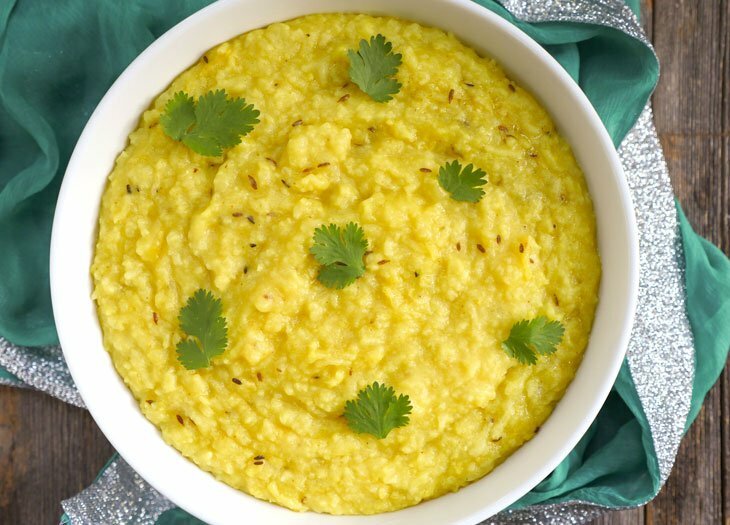 Hi Naina, khichdi is supposed to be mushy – kind of like oatmeal or a really thick dal 🙂 That’s why it’s a good first food for babies and also for the elderly and sick. The taste was good, but 20 minutes was WAY too long. The rice turned to mush. I think 5 – 8 minutes on Manual High is more than enough. Amita, the rice is meant to be mushy in khichdi… but feel free to adjust to taste. Hello Making this recipe do I keep it on sautee button or change to something else on instant pot? Sarah, once you are done with the satué button you’ll need to press either manual or pressure cook (depending on your model) to start pressure cooking. Hope that helps! I just made this tonight. Sooooooo good! Thank you! – natural pressure release or press the button (i have the Ultra 6qt) to force the pressure release? – rinsing the lentil and rice before or just let it soak for the suggested time and then straight into the pot? – any other tips/tricks to make sure you don’t over cook rice dishes in the IP? Chetan, I hope your little one is doing well! This recipe calls for natural pressure release for 20 minutes, so once the recipe is done, wait an additional 20 minutes then open the valve. I soak the rice and dal for 15-30 mins (in step 1) – this way they absorb a bit of water – if you didn’t soak them then you’ll want to add more water to the dish. Hope that helps! I’ve been making this often for lunch, my preschoolers really like it. I haven’t soaked the lentils or rice (and I’ve used brown basmati rice) and it’s been very soupy after cooking. I have to drain it with a fine mesh sieve before we eat. I’m going to try it with five cups of water next time. I mix frozen peas into it to both cool it down and get my kids to eat peas and we love it! Thank you! Mary, that’s so great to hear! 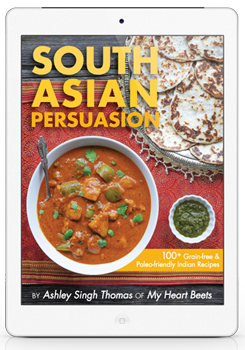 I haven’t tried making it with brown rice, but I believe a few people in my facebook group (Instant Pot for Indian Food) have tried – perhaps try asking there for suggestions on using brown rice? I am sick and feeling homesick at the same time for khichdi, and every recipe out there is overly fussy and doesn’t look at all like what I consider to be “upset tummy khichdi” – haldi, rice, daal, salt. I followed yours but cut out the cumin and bay leaf and it’s perfect. Thank you for helping me to feel just a little bit better on an otherwise miserable day. Maya, I’m so glad that this recipe made you feel a bit better – I hope by now you’ve made a full recovery and are feeling 100 percent! Love this receipe! I mixed it with plain yogurt and it was amazing! My doctor wants me to eat this 3 times a day for 3 days. I am in a food program and need the nutrient/caloric breakdown. Have you by any chance worked that out at any point?? Thank you!!! I added asafoetida and some dry red chilis during the sauteing step. 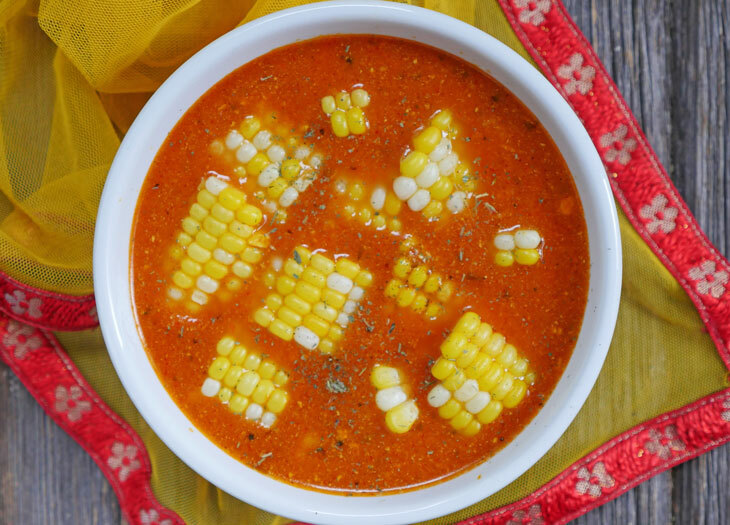 This recipe is so simple and satisfying! If I double the amount of rice and dal, does the cook time change? Double all the ingredients but keep the cook time the same 🙂 hope that helps! Love this recipe. So comforting and soothing. I have made Khichdi my whole life but this was so good! I have never cooked it for that long and I will never make it any other way again. Thank you!!!! Made this for the first time tonight, and it was just what we needed after a day of sneezing and feeling under the weather due to a cold. The flavor and texture were soothing. We added cilantro at the end and stirred in a little bit of yogurt. This is a dish we’ll definitely make again! Jaya, I’m so glad that you made and liked this! I hope you are feeling much better 🙂 Thanks for letting me know how it turned out for you! Loved it Ashley! However, is it supposed to very bland? How can I add a tadka to it? Thanks, your the best!! I loved this! I just made it, and added some chopped fennel during the saute phase. I didnt have Ghee so just used a pat of butter and chopped cilantro to top it off. So, so good! Thank you for the recipe. 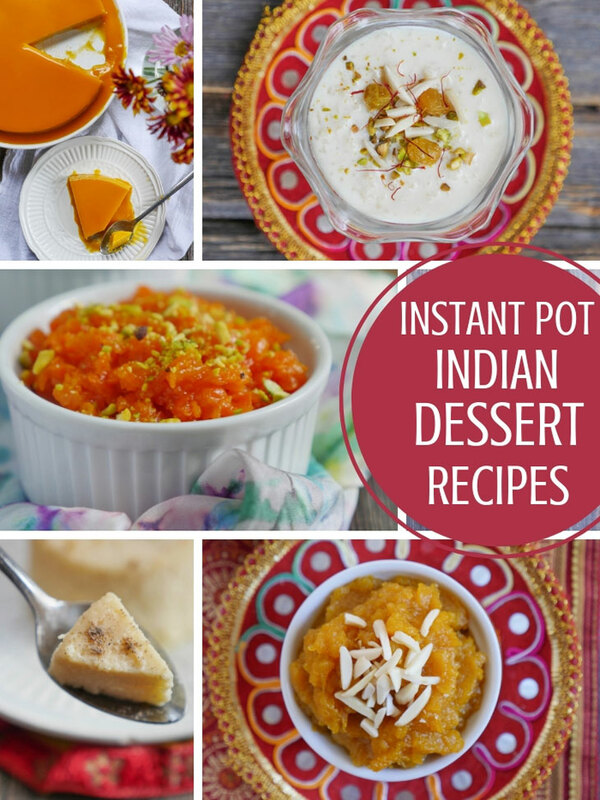 I m new to instant pot and with the help of receipe it was easy for me to make my 1st dish. It turned out to be good but I messed up little with water ratio. Can you please let me do we need to use the measuring cup which we got with instant pot. Ashley I tried this recipe. It came out really well. If I reduce the ingredients to half do I need to reduce the time? I want to learn basics of instapot. Any suggestions where I can find it? Thank you. 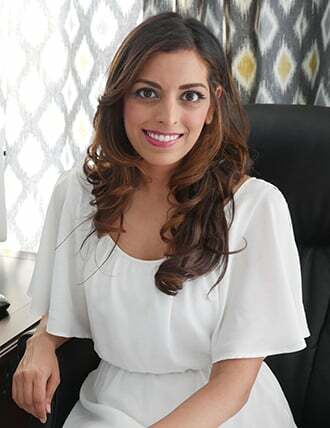 Aditi, I’m so glad you liked it! 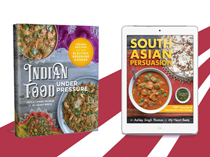 I can’t wait to hear what you think of my other recipes! To answer your question – you can likely decrease the cook time but I’m not sure by how much – or you can leave the cook time the same and the pot will just take less time to reach pressure due to less contents in the pot. Hope that helps! As for basics, I’d suggest watching some youtube videos or google! When I was making this recipe, I kept thinking how bland the end product would be due to the fact that only 1 spice is being used. But my whole world turned upside down when I tasted this khichdi. The flavors of the ghee, turmeric and roasted cumin complimented each other so well that I devoured had if it in one sitting. I’ve made this recipe 2 more times, and have not had the heart to tweak it. 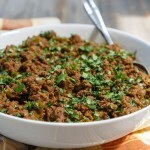 I enjoy it with bhindi masala or yogurt or lemon pickle… It goes with anything. One of favorite recipes of all time! Ashley, Can we use short grain sona massori rice for this recipe? If yes, how much water should be added? and what is the IP setting? 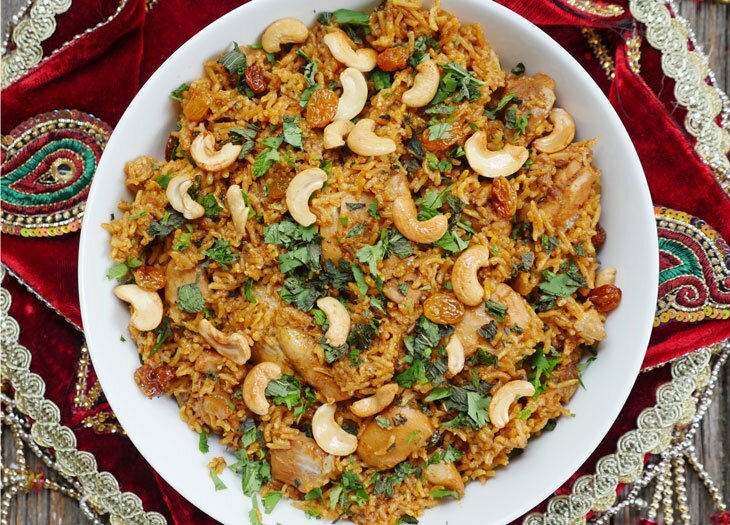 You can use sona masoori for this – keep everything the same 🙂 I prefer basmati but have made this using sona masoori as well.